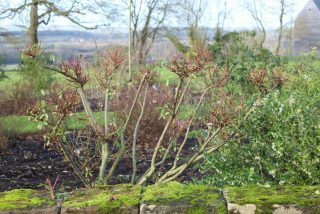 Those shrubs which flower on the current season’s growth, such as deciduous ceanothus, buddleja davidii and hydrangea paniculata, need a hard prune in the early spring, when there is no more danger of severe frosts. If unpruned, the plants become leggy and flower less. When they are young, the plants get pruned back to a framework of about 50 cm. If positioned at the back of the border, the framework can be taller. Once the framework has been established, the growth from the previous year is pruned back to two or three pairs of buds. 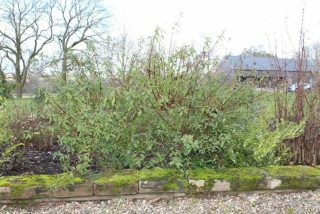 In the case of Buddleja davidii which grows very vigorously and reaches a height of 2 to 2.5m each year, it is important to “half-mast” the plant in the autumn to prevent wind rock in the winter (see November archive). 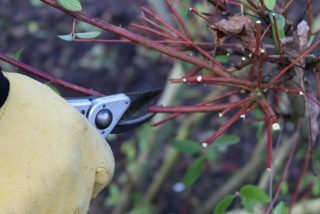 For these shrubs, it also necessary to remove shoots entirely if they have become too dense and to remove with loppers or a pruning saw those parts of the framework which have become unproductive. Pruning and dead-wooding of Buddleja davidii ‘Black Knight’. Cave: Buddleja alternifolia is not subjected to this method, but only gently pruned in the summer after flowering to maintain a graceful arching habit!